(Trent Nelson | The Salt Lake Tribune) Cedar High School is considering a change in the name of its mascot, The Redmen, Friday Jan. 11, 2019. 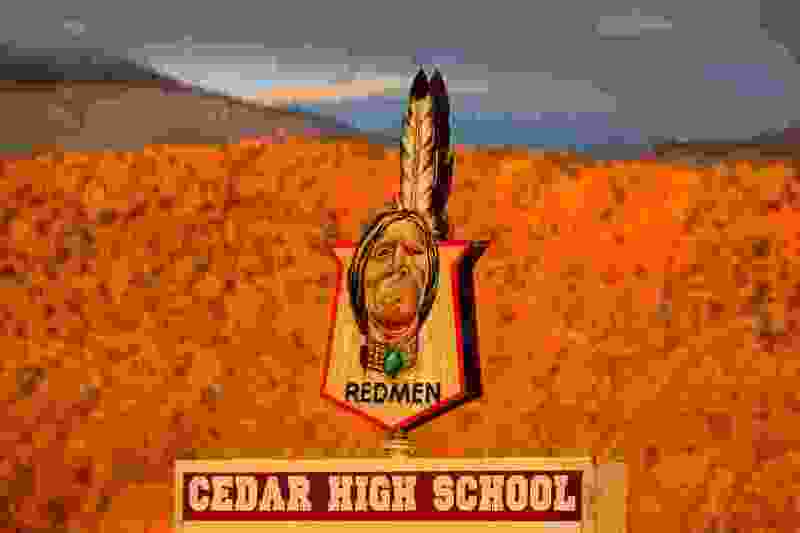 Cedar High School’s controversial “Redmen” mascot will be removed following a 3-2 vote of the Iron County School Board. The split vote came amid chants of “Vote ‘em out!” and angry shouting and booing from proponents of the mascot. “I believe there is only one correct decision here: We need to ... respectfully retire the Redmen mascot,” said school board President Stephen Allen. The district launched discussions this year, “to review the mascot at a time when there was not a crisis,” Allen said. In recent years, the mascot has generated controversy that peaked in 2016, when video circulated nationwide, showing the school’s drill team putting on black braided wigs for a Native American-themed dance routine. “If you don’t like our peaches, get the hell out of our tree,” Brinkerhoff said, eliciting cheers from the crowd. Lambert said the statements and letters the board reviewed came almost entirely from Cedar City residents and alumni of the high school. “The only outside special interest group we have heard from was the Native American Guardians Association,” Lambert said, referring to a North Dakota-based group that encourages teams to keep their American Indian mascots to celebrate Native American heritage. The group came to Cedar City on Saturday and spoke in support of the mascot. “There’s no left-wing liberals, no outside group motivating this,” Lambert said. A district-appointed committee in January voted 17-7 to recommend that the district drop the mascot after three often tense and tearful public hearings. The issue has divided members of the Paiute Indian Tribe of Utah, which is headquartered in Cedar City. Current CHS students who are American Indian have spoken out on both sides of the issue. Some have said the mascot is a source of pride. Others rejected claims that that mascot “honors” Native American people, saying that argument erases the racist bullying they have encountered at the school, as well as the historical oppression of American Indian communities. Allen pointed to a recommendation from the American Psychological Association, that schools should discontinue Native American mascots because of research showing they harm social identity development and self-esteem among American Indian teens and perpetuate stereotypes among non-Native students. But board member Mary Ann Kemp said that research is compromised because people who work in academia are disproportionately liberal. “Unfortunately, it has become fashionable in our society today to be offended,” said Kemp, who voted with Brinkerhoff to keep the mascot. Thalia Guerrero is one of the students who has spoken out against the mascot. Guerrero, a senior, said students who feel excluded by the name — widely considered a racist slur outside of Cedar City — are pressured not to complain because a vocal majority want to keep the mascot. “But it’s OK, I respect him,” she said quickly. She said the entire controversy has put a lot of American Indian students on the spot, being prodded for opinions, and she hopes to see a new mascot chosen quickly. Allen and Lambert joined Michelle Jorgenson in voting to change the mascot. Those measures still should be considered, Lambert said.